... Already featuring integrated intake filters and control valves, these compressors can be fitted with other accessories without a problem. The blast-air cooler, which is also integrated, guarantees a very low blast air temperature. The compact cover ensures low noise and heat emission. Optional corrosion protection also makes these compressors suitable for extracting moist air. 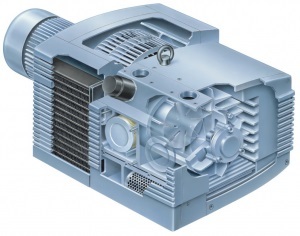 performance data of rotary vane compressors. It matches compressor delivery exactly to customer requirements. Energy consumption is optimised and constant vacuum is guaranteed even where demand is subject to Variation or severe fluctuation. As no unnecessary blast air is generated, air discharge noise is kept to a minimum. "Gentle" compressor start-up reduces strain on mechanical components and reliably extends their useful life. Variable Output ranges minimise the number of different types required, thus also providing logistical advantages. With this special development [suitable for the application], Becker extends its popular DT/KDT/DTLF product range by the models DX, KDX and DXLF.